Wayne LaPierre is the executive vice president and CEO of the National Rifle Association of America. LaPierre was born Wayne Robert LaPierre, Jr. on November 8, 1949, in Schenectady, New York. His father was an accountant for the local General Electric plant. He is the eldest child of Hazel and Wayne, Sr. The family moved to Roanoke, Virginia, when LaPierre, Jr. was five years old, and he was raised in the Roman Catholic church. He has been active in government relations for most of his adult life serving in positions on the board of directors of the American Association of Political Consultants, the American Conservative Union, and the National Fish and Wildlife Foundation. Since 1991, he has served as Executive Vice President and chief executive officer of the National Rifle Association (NRA), the largest gun rights and small arms industry advocacy organization in the United States. LaPierre joined the NRA in 1977 after working as a legislative aide to a Democratic Virginia delegate, Vic Thomas. Over the past two decades, under his leadership, the NRA has witnessed unprecedented growth in membership, resources, and political strength, which has led to the greatest expansion of second amendment freedom in American history. 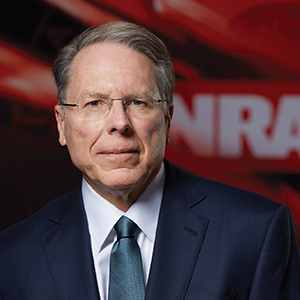 LaPierre serves as the public face and voice for NRA’s 5 million members and America’s 120 million gun owners who are among this nation’s most politically savvy and engaged voters.